In the Niagara Region, the Royal Canadian Henley Rowing Course in St. Catharines, Ontario will host the rowing competition and the Flatwater Centre in Welland will house the Sprint Canoeing competitions. 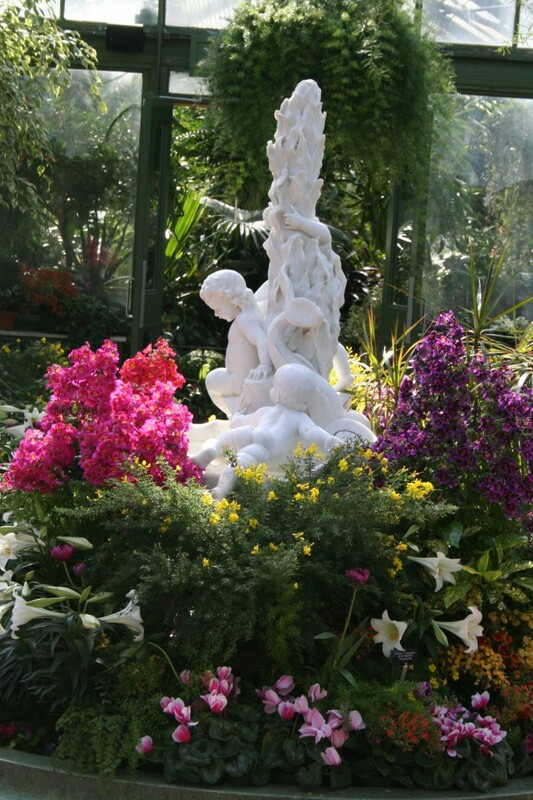 Nearby at the Niagara Parks Floral Showhouse, a floral tribute to the Pan Am and Parapan Am games has been created to recognize the importance of the event and show support for all the athletes, coaches, families and fans. 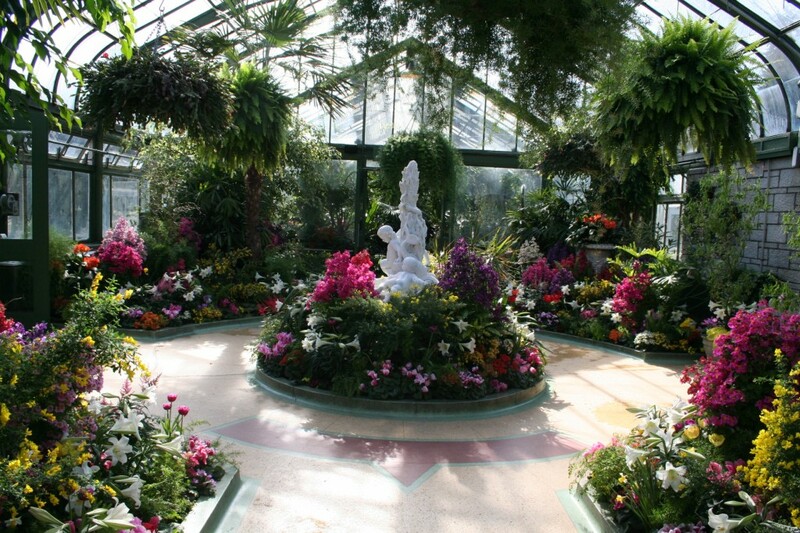 The Niagara Parks Floral Showhouse is located just south of the Horseshoe Falls in Niagara Falls, Ontario Canada. 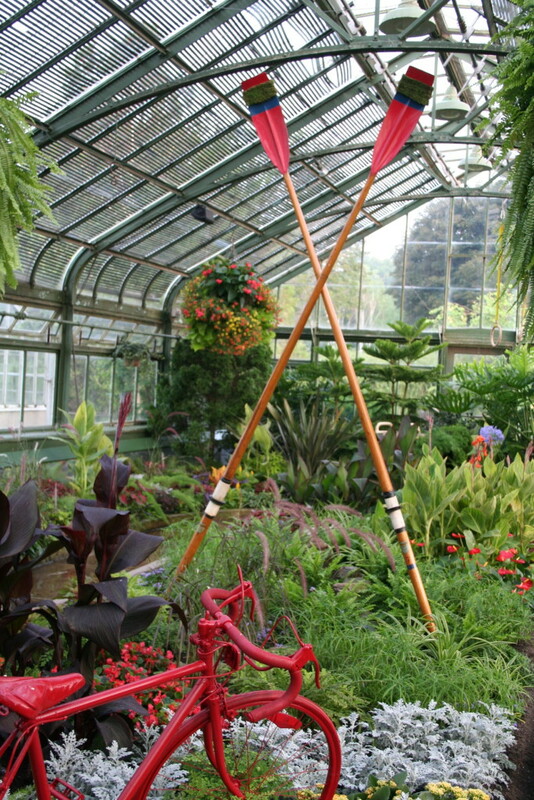 To acknowledge the Pan Am and Parapan Am Games rowing events that will be taking place in nearby St. Catharines, Ontario, the Floral Showhouse included real oars in their summer floral display. 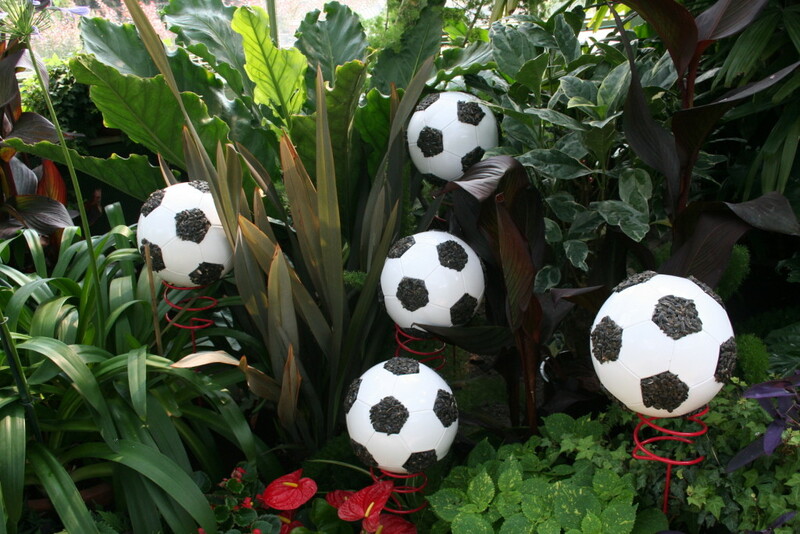 The men’s and women’s Football/Soccer competition for the Pan Am Games is recognized at the Niagara Parks Floral Showhouse with balls ready for goal scoring among the tropical plants. 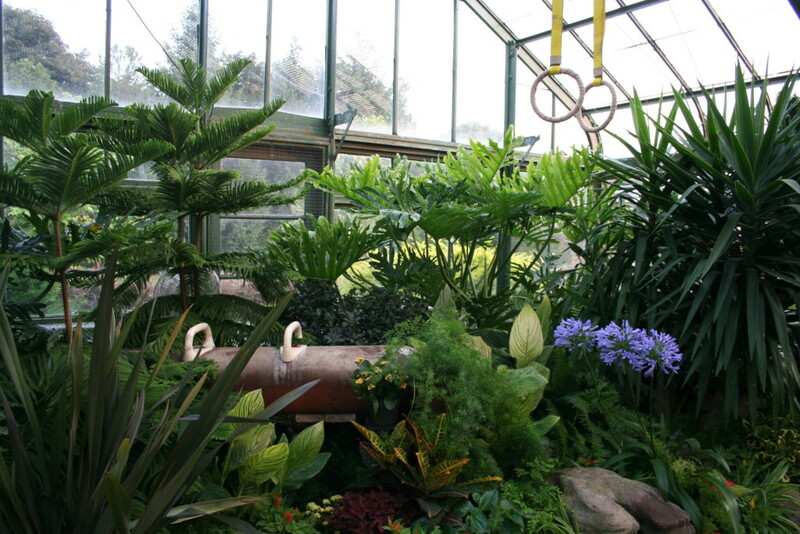 A surprise greets visitors at the Floral Showhouse when they see a real pommel horse on display among the tropical plants. The Pan Am Games gymnastic events start on July 11th. 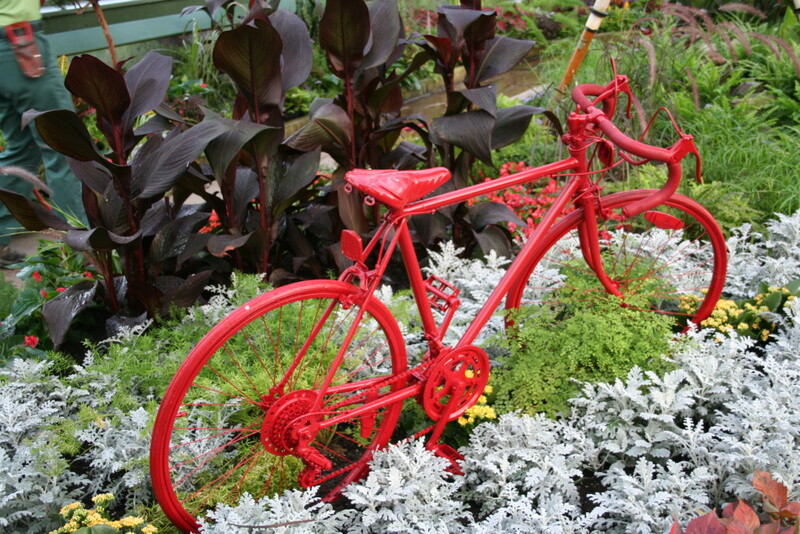 The Niagara Parks Floral Showhouse tribute to the Pan Am Cycling competitions which include BMX, Mountain Biking, Road and Track categories. 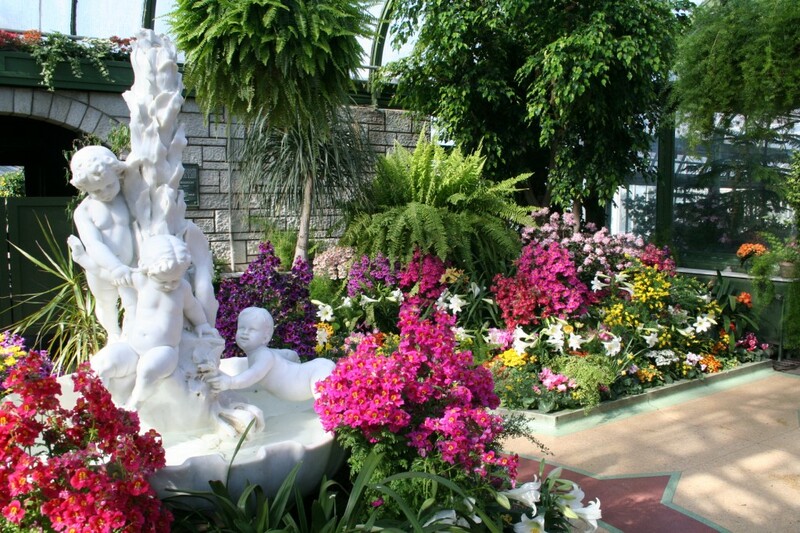 Admission to the Niagara Parks Floral Showhouse is $5.00 for adults and $3.75 for children (6-12 years) + tax. 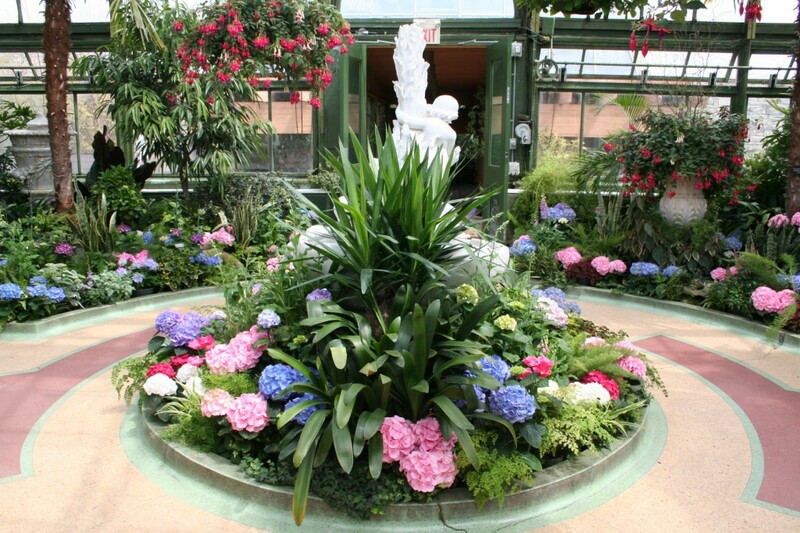 The Floral Showhouse is open from 9:30 am to 5:00 pm daily. The Pan Am and Parapan Am tribute and Summer Show runs through mid-August. The flower started to open about 7:00 pm on Saturday, June 20th with the spathe unfurling to reveal a beautiful maroon colour inside. After watching the bud grow taller and swell expectantly for over a month, the opening was a bit of a surprise because it happened so fast. Looking at the live webcam at first didn’t seem like it could be happening. But it was true. Clive, one of the largest Titan Arums at the Floral Showhouse was blooming again. 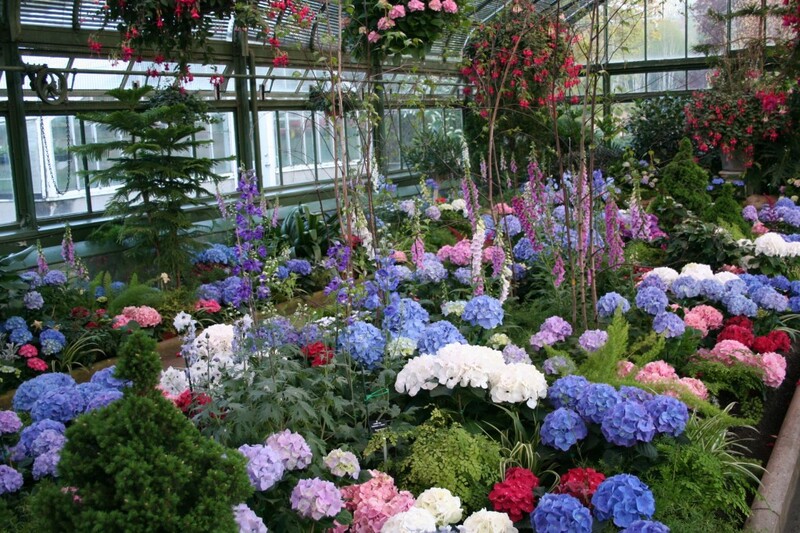 Arriving at the Floral Showhouse would first reveal an olfactory assault – more confirmation that Clive was indeed blooming. 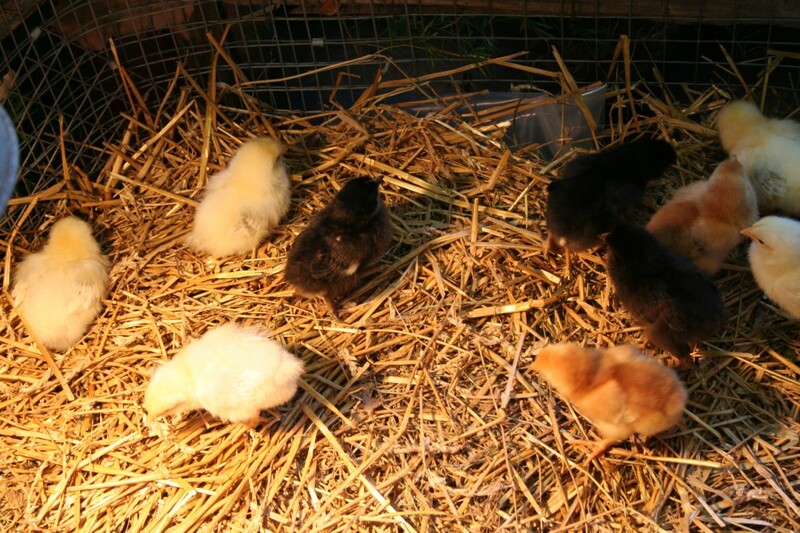 And second, there was visual proof! It was 2012 when Clive bloomed last. The final height at blooming today was recorded at 84 inches (2.13 m). And yes, the Corpse Flower name really does apply to this flower. As Clive opened, the putrid smell of decaying flesh got more intense – especially when climbing a ladder to get a top down photo! 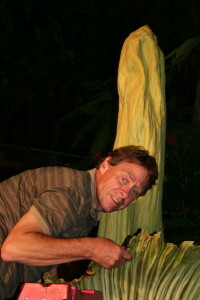 Wayne Hoeschle, Titan Arum curator cross pollinating Clive on opening night. 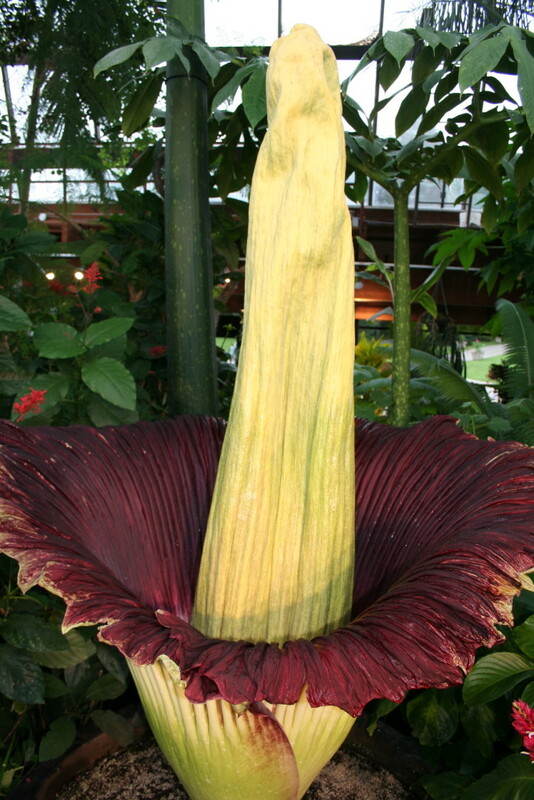 The female flowers can be seen through a cut out window of the Titan Arum bloom at Niagara Parks. Male pollen from McMaster’s Titan Arum that bloomed June 3, 2015 was used to cross pollinate the flower this morning in the hopes the Clive will produce seed. 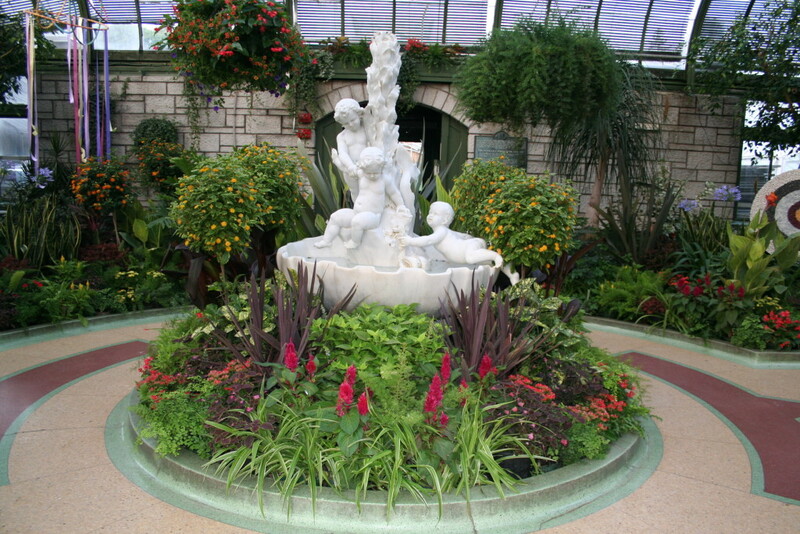 The plant, Amorphophallus titanum, called the Titan Arum or Corpse Plant, is one of six dormant corms donated to Niagara Parks by Louis Ricciardiello of Gilford, New Hampshire, in December 2011. 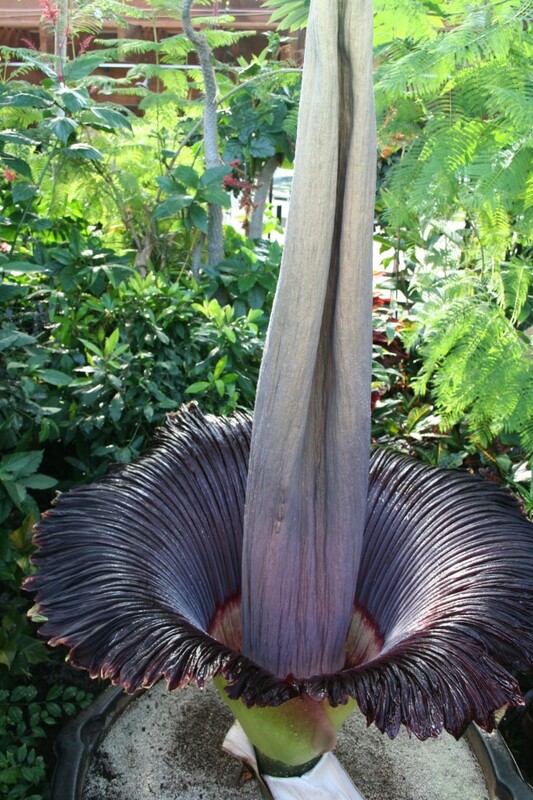 Titan Arum specimen #1, nicknamed “Morph,” bloomed for the first time at Niagara Parks on May 4th, 2012. 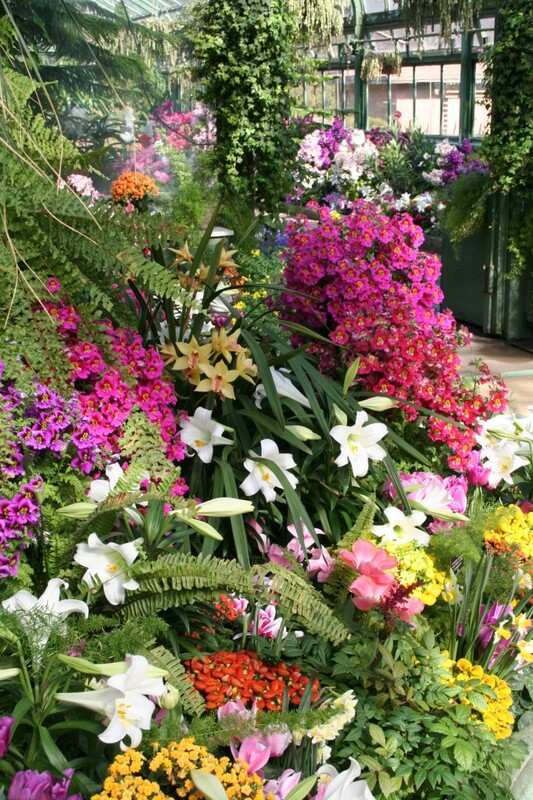 At blooming the flower was an incredible height of 244 cm (96 inches). 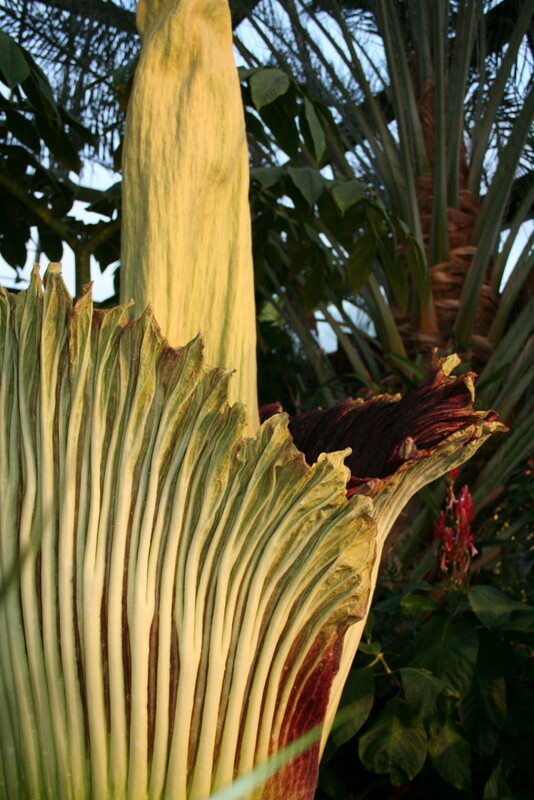 After the Titan Arums bloom, they go dormant for months, and then send up a huge leaf that measures 6 m (20 feet) tall. That leaf soaks up the sun for a year or more and, with the copious amounts of water and fertilizer, puts nutrients back into the underground corm to hopefully return it to blooming size. 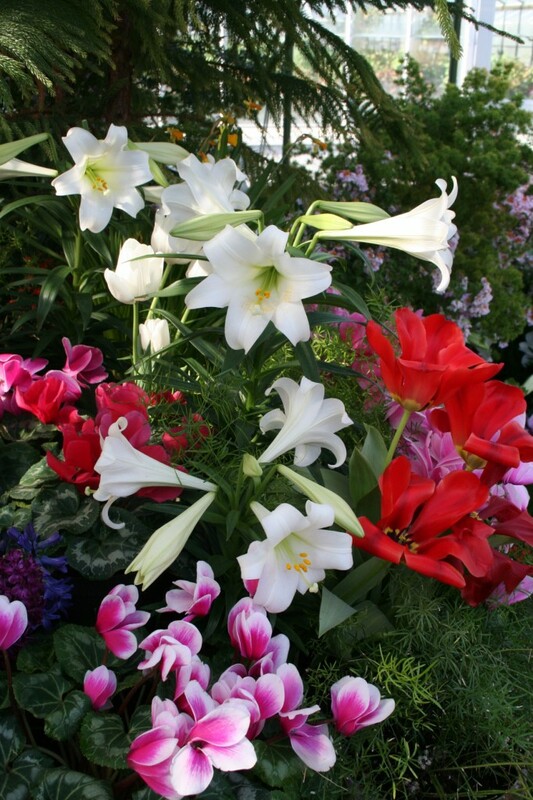 A blooming size corm weighs an impressive 80 kg (175 lbs) and is about 70 cm (27 inches) in diameter. 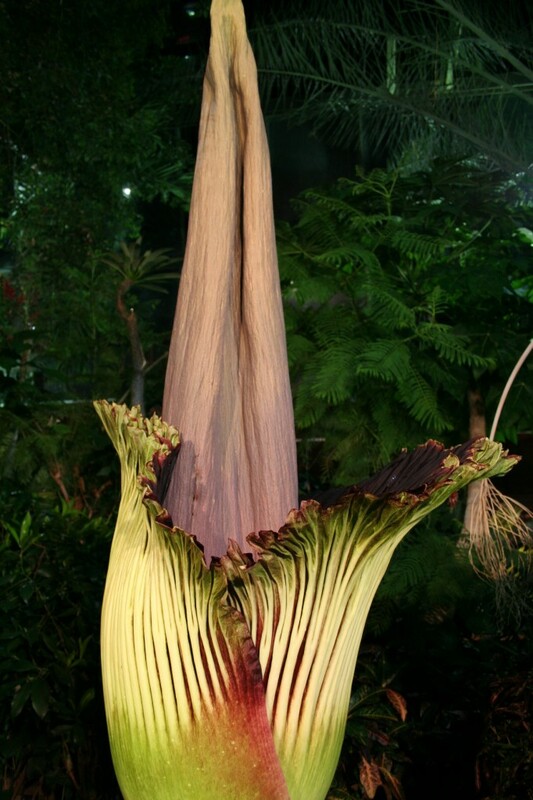 For the latest news on the Titan Arum bloom visit the Niagara Parks Facebook Page or the Miracle Farm Blueprint. 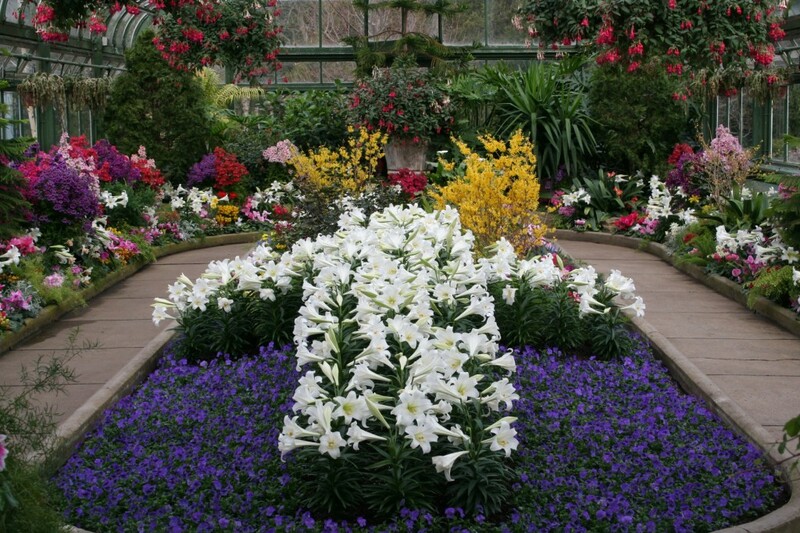 Take a look at the Titan Arum live webcam on the Niagara Parks Floral Showhouse website for the latest flower view. The flower started to open about 9:00 pm on May 27th with the spathe unfurling to reveal a beautiful maroon colour inside. By the next morning, the full glory of the spathe could be seen. 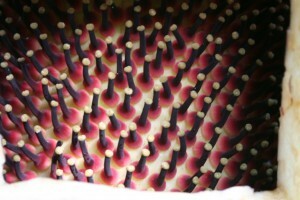 The female flowers can be seen through a cut out window of the Titan Arum bloom at Niagara Parks. Male pollen from Ohio State’s Titan Arum was used to cross pollinate the flower this morning in the hopes the Morph will produce seed. Morph, one of the Niagara Parks’ Titan Arums beginning to bloom on May 27th, 2014 at 11:30 pm. Morph is now 91 inches tall (2.3 m) and is going to bloom any day now! The outer sheath has fallen away and the frilly spathe can now be clearly seen as well as the “squished French bread” spadix. 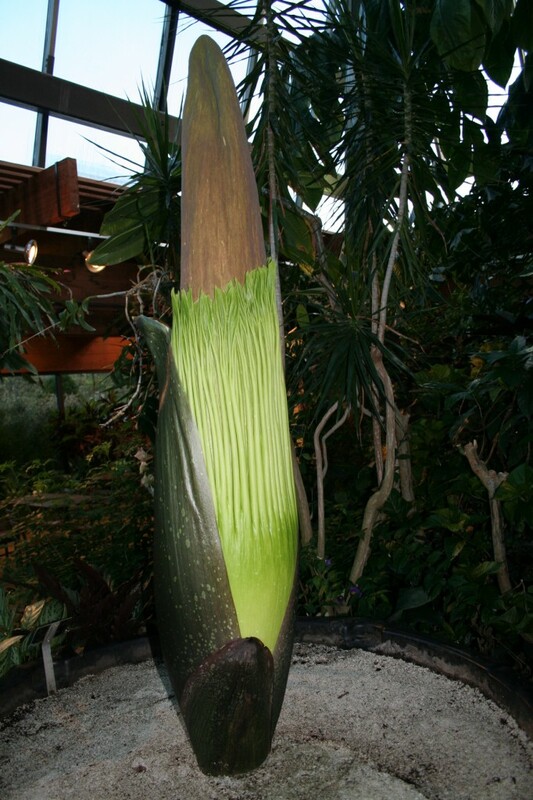 One of the Titan Arums at Niagara Parks is about to bloom again. The plant, Amorphophallus titanum, called the Titan Arum or Corpse Plant, is one of six dormant corms donated to Niagara Parks by Louis Ricciardiello of Gilford, New Hampshire, in December 2011. Titan Arum specimen #1, nicknamed “Morph”, bloomed for the first time at Niagara Parks on May 4th, 2012. 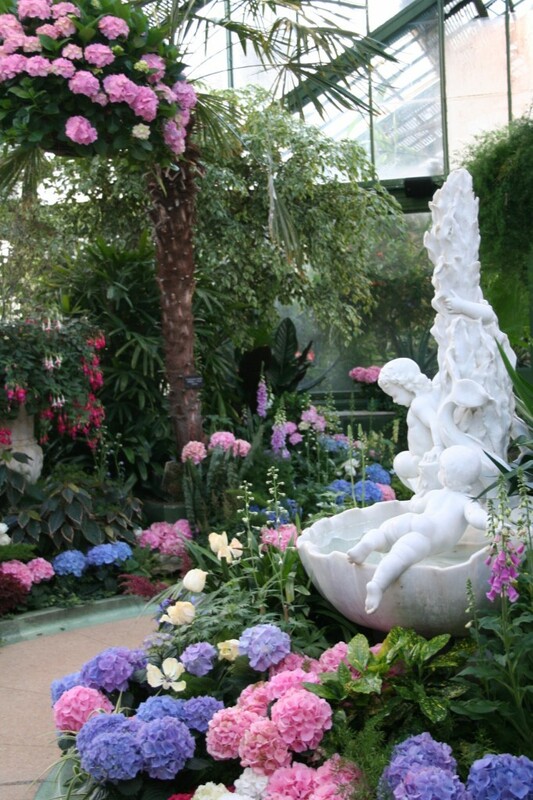 At blooming the flower was an incredible height of 244 cm (96 inches). 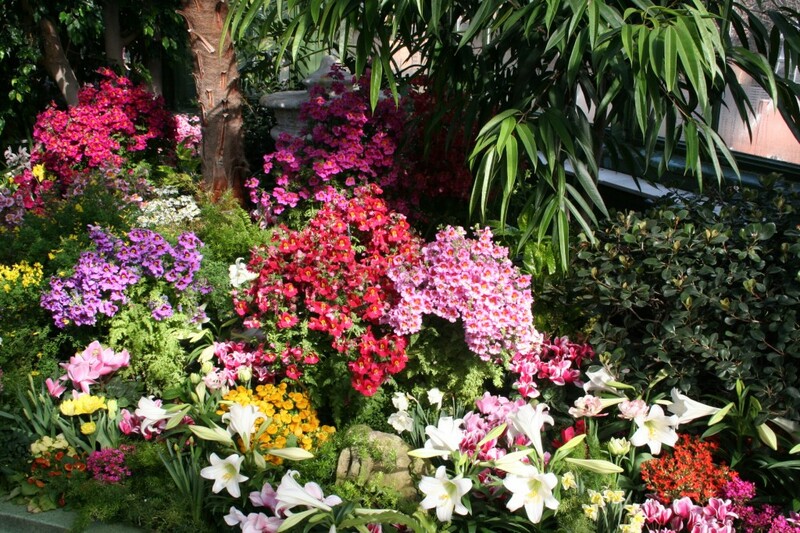 After it bloomed, Morph went dormant for five months, and then in October 2012 it grew a huge leaf that measured 6 m (20 feet) tall. That leaf soaked up the sun for a year and, with the copious amounts of water and fertilizer, put nutrients back into the underground corm to hopefully return it to blooming size. 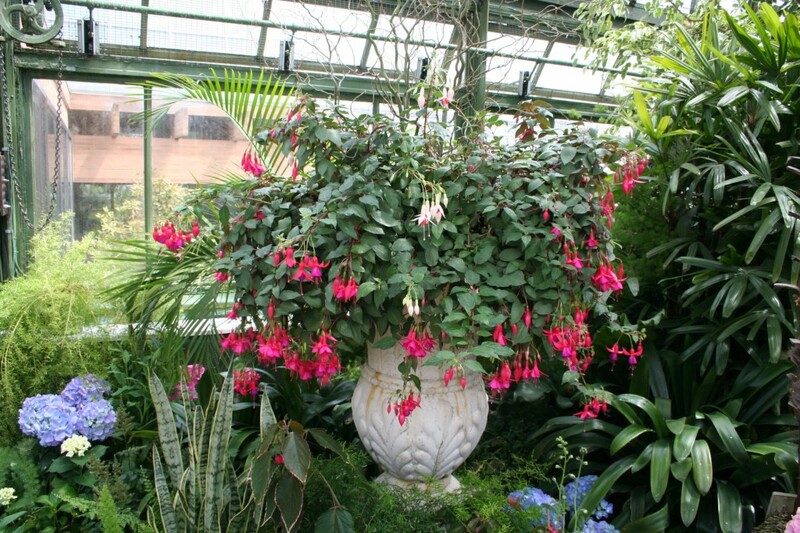 The plant went dormant, and during the winter of 2013-2014 it was repotted. At that time, the corm weighed an impressive 80 kg (175 lbs) and was 68 cm (27 inches) in diameter. 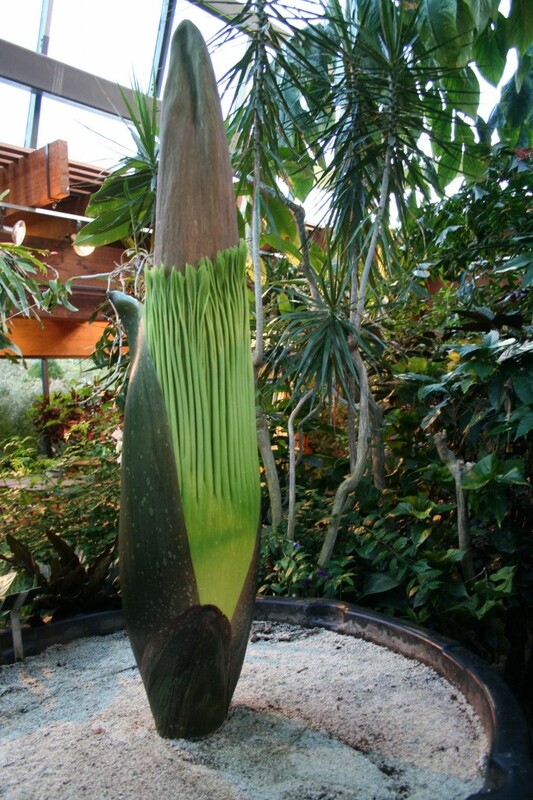 Now, in May 2014, after a two year wait the Titan Arum is sending up a beautiful flower bud. The anticipation is building as Morph’s new shoot gets measured every day by Wayne Hoeschle, its caretaker. 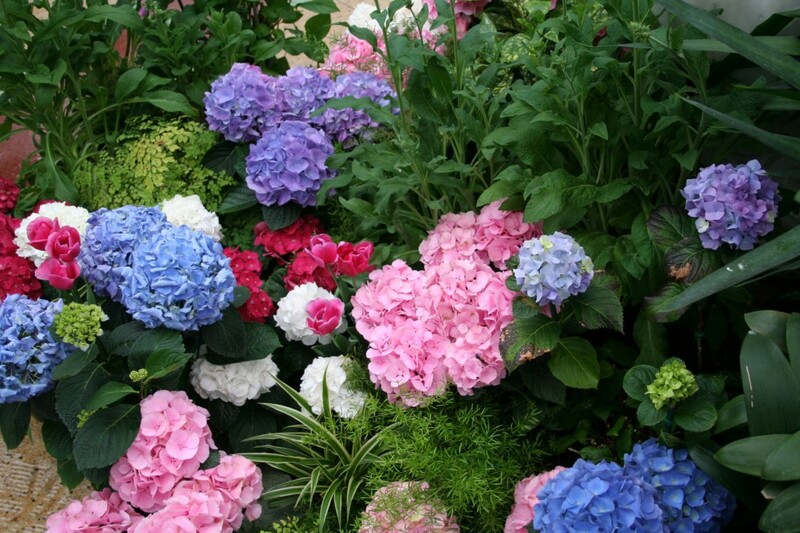 The shoot is growing between 3 and 6 inches every day and is expected to bloom in about a week. As of this morning, May 22nd, 2014 Wayne reports that Morph is 200 cm (79 inches) tall. The two pictures below were taken May 18th at 65 inches in height. 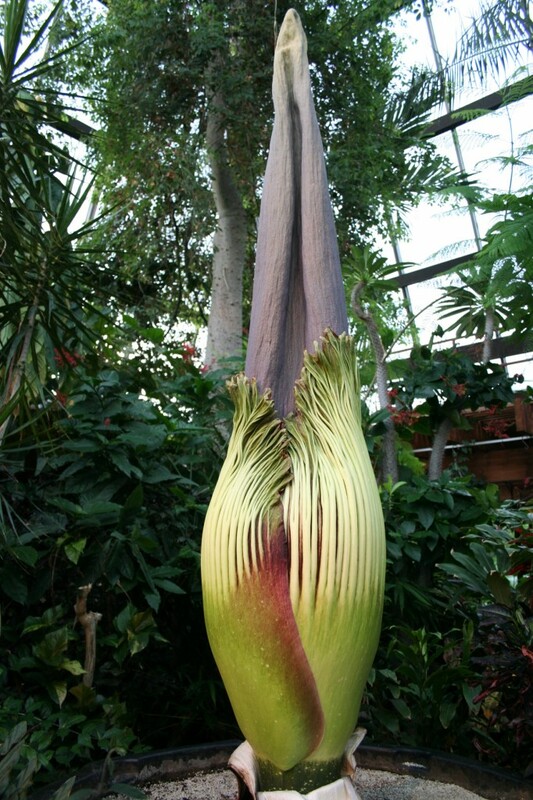 Take a look at the Titan Arum live webcam on the Niagara Parks Floral Showhouse website for the latest flower bud view.